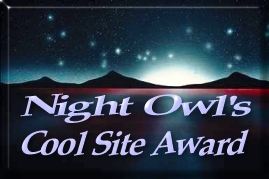 The Night Owl's Cool Site Award was awarded to us on January 24, 2002. This award was given in recognition for having a great design. "It is obvious that you have spent a lot of time and work on all your pages making your web site a pleasure to view. " 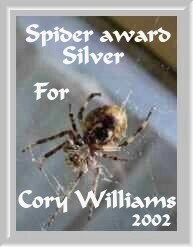 The Spider Award - Silver was awarded to this site on January 24, 2002. This award was given for making the web more informative and fun. "Thanks for this wonderful contribution to our Internet community, which helps make the web more informative as well as more fun. I really enjoyed my visit to your site." 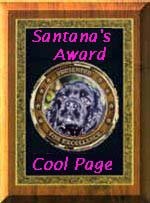 The Santana Cool Page Award was awarded to this site on January 21, 2002. This award is given in recognition by a very cool dog named Santana. The Diamond Award was awarded to this site on January 24, 2002. It was given for excellence in web page design. "Good website with alot of information. A very nice resource place on the internet. Good Luck on your future success." 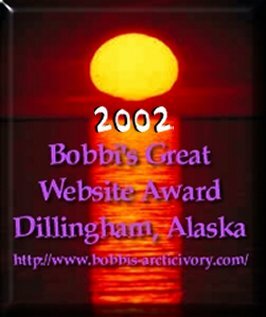 The Bobbi's Great Website Award was awarded to this site on January 24, 2002. This award was given in recognition of a well designed site. "Congratulations on winning our now famous Alaskan Award. We are pleased to be able to have you as one our recipients." The Award Of Excellence was awarded to this site by Carmen on January 24, 2002. The award was bestowed for excellence in web page design. "Congrats on winning our award.You have a great homepage. Keep up the good work."